Many epiphytes grow on mossy tree branches in nature, and it's also a natural growing medium for many terrestrial orchids that originate in bogs. (Many epiphytic orchids do well mounted on slabs of bark, with moss around their roots. Many orchids that don't grow in moss in the wild will appreciate it in cultivation; moss can be a reasonable approximation of leaf litter, for instance. 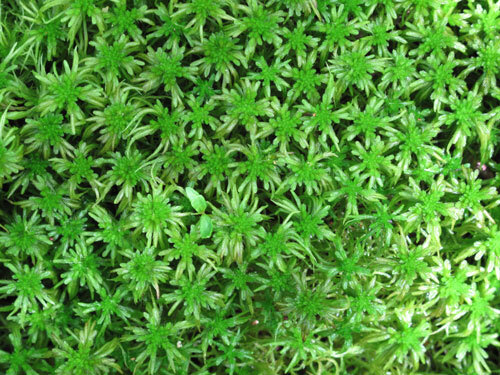 Sphagnum is remarkably good at retaining both moisture and air, which is what many orchids like. The cells are highly absorbent, but large air pockets are left in between. In practice, orchid roots in moist moss may be "dry" but in an environment with close to 100% humidity, so that the velamen on their roots can absorb moisture but there is no shortage of air. Most orchids that grow well in moss like to be watered before the potting mix gets completely dry, so there is at least a little moisture all the time. Despite remaining continually moist, the moss has some ability to resist various kinds of rot. (In fact, preserved, mummified bodies are sometimes found sunk in peat bogs hundreds of years after the person died!) This can help to alleviate fungal and bacterial orchid diseases often associated with overwatering. But it's best to repot most orchids grown in moss annually, because the moss gradually breaks down and compacts, which can smother roots. When potting orchids in moss, don't pack it too densely; this can make it end up drying too slowly, so that it's soggy all the time. Of course, putting it loosely into the pot can make it dry too quickly. For most orchids, it's best to pack it just tightly enough around the roots that the plant is stable in its pot; if you turn the pot on its side, for instance, the plant shouldn't tip over.